Influenced by a wide variety of modern day and classic hard rock/heavy metal bands (METALLICA, LED ZEPPELIN, LYNYRD SKYNYRD, STAIND, SEVENDUST, MUDVAYNE, etc. ), it has all come together within the grooves of Brutally Beautiful, the sophomore full-length by rockers A.Z. And this fall, the band will be performing many standout tracks from the album at various venues throughout the U.S., when they launch their own headlining jaunt, "Project Independent Living Loud Tour", which will run from October 14-25. The band - which consists of Clark Walker (vocals/guitar), Josh Smith (guitar), Josh Thompson (guitar), Buck Gillispie (bass) and James Parker (drums), and whose name is an abbreviation for ABSOLUTE ZERO - has been touring heavily and steadily so far this year, including sharing (or about to share) bills with the likes of FRAMING HANLEY, BUCKCHERRY, NONPOINT, FOZZY, ALMOST KINGS, CATHERCIST and 12 STONES. And there have been quite a few telling signs that A.Z. is undoubtedly on the uprise of their career, as the band now have tailored their custom light show even further, adding their own sponsored A.Z. "Brutal Cabs", made by PME Cabs, containing built in lighting. This along with their custom stage props, built by Rebel Iron, lets A.Z. bring a huge show to even the smallest venues. Additionally, A.Z. have added to the great team of people around them by adding Zach Mullinax as their booking agent, and George Roskos along with Architekt Music offering them a development deal in addition to the consultant/management role he has filled. Also, the band has added DrumTacs to their list of sponsors. 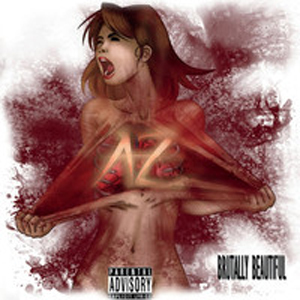 If that wasn't enough work cut out for A.Z., the group is also planning on shooting a music video for the single "Reflux" in the coming months, which undoubtedly, will only add to the ever-increasing buzz surrounding the band. But first things first - A.Z. will be rocking the U.S. in October! "Starting October 15th in Huntsville Alabama, A.Z. ventures out headlining 2014's Project Independent Living Loud Tour," says Walker, "Bringing our brutal, high energy melodic metal to the masses on stage and by live webcast! With hard hitting chunks of metal, custom tailored LED light show, and non-stop energy, I truly believe A.Z. is a must see artist on the Project Independent Tour for 2014."